Myths about hypertension. Blood pressure is a popular health subject for discussion among young adults and elderly. Besides there are many resources where a lot of relevant information are available. A short visit in a bookstore or a fast search in the web could answer many of your questions about hypertension. However, this could be a reason that like most medical subjects, high blood pressure is also very liable to misinterpretation. The best way to avoid confusion is to educate yourself in the first place, about what exactly is hypertension. This will help to refine your knowledge and maintain a more efficient attitude before your condition. Myth #1: I don’t use table salt at all. This means that I do not exceed the normal limits of sodium intake. Whole wheat bread: 260-400mg of sodium per slice. Breakfast cereals: 170-200mg of sodium per serving. Cottage cheese: 400mg of sodium per 1/2 cup service. Nut butter: 125mg of sodium in 2 tablespoons. Tomato sauce (canned): as much as 670mg of sodium per serving. Myth #2: One of my parents has high blood pressure. It is unlikely that I can do something to prevent it. 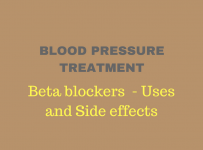 Blood pressure etiology is a matter of nature and nurture. Many risk factors work together for hypertension to appear at some time in your life. However genetics are only a small part of high blood pressure etiology. This means that even if you carry some family traits that put you in risk of developing high blood pressure, these will never become expressed if you stay away from junk food and smoking. Myth #3: People with high blood pressure have headache and feel dizzy. I feel fine so I have nothing. Not true. High blood pressure appears without symptoms in most people. And actually you may feel fine, especially if you are less than 40 years old when your body is able to handle better blood pressure fluctuations. Myth #4: I use kosher salt or sea salt during cooking and in my plate. These are sodium substitutes. They are not. Both of those types of salt have the same sodium concentration (40% sodium) as common table salt. Myth #5: I read about benefits of wine to the heart, so I can drink as much as I wish or I should start drinking. Too much of a good thing is never a good thing. Wine belongs to alcohol containing drinks and is allowed only in small amounts. Αs a rule of thumb just 1 alcoholic drink per day for women and 2 for men will not harm to your blood pressure. Five ounces of wine (=150ml) is considered one drink. Red wine has been found to be beneficial for cardiovascular health because of high content in some antioxidant substances called polyphenols like for instance, resveratrol. All of the above apply in case that you are a regular drinker. But if you don’t ready drink alcohol for any reason, you are not supposed to start drinking! 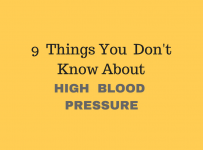 Myth #6: I know that I have high blood pressure and I check it only in my doctor’s office. It is not necessary to check it at home. Blood pressure values could present variations related to daily activities. This is particularly true for those already diagnosed with high blood pressure. So a single measurement per month may not represent your actual blood pressure. In fact some people have blood pressure spikes every time they enter the doctor’s office, the so called “white coat hypertension”. It is advisable to purchase your own blood pressure monitor and learn how to use it correctly. Myth #7: I was diagnosed with high blood pressure and the doctor has prescribed medications for that, but I now have normal readings so I stopped using them. Hypertension is a chronic condition with outbreaks and remissions. Your prescribed medications aim to prevent the eventual outbreaks and blood pressure spikes, which you are supposed to deal with. Most of these drugs are effective only when taken regularly, because a missing dose could disrupt the effectiveness of treatment. In case you consider that your prescribed medications are ineffective or futile, consult your doctor. Myth #8: I have high blood pressure so I shouldn’t exercise. Exercise is recommended in high blood pressure and and heart disease by the American Heart Association. Actually any type of exercise is allowed as long as it i performed consistenlty and in moderation. Bicycling, running, weightlifting, stretching and strength training, all could be included in your daily training program.